Mark making and early writing with young children, with help from Fleetwood Mac, Jean Michel Jarre and Captain Pugwash! What does the word ‘pirate’ mean to you? If you are relatively young, (in other words born after the 1970 Isle of Wight Rock Festival), then you are probably thinking Johnny Depp and Disney’s Pirates of the Caribbean. 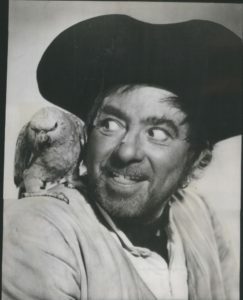 If, like me, you were born before the festival, then you might be thinking about the terrifying depiction of Long John Silver by Robert Newton in Disney’s 1950 version of Treasure Island. (I saw it at a friend’s house when I was six and have never fully recovered from my sheer terror at the one-legged freebooter’s malevolent sneer and Newton’s appalling faux Bristol accent. My therapist traces my aversion to Bourneville’s Old Jamaica chocolate back to this early childhood trauma.) If you were at the I970 IOW festival, then you won’t remember a thing, but read on anyway. The human psyche is a strange thing (mine anyway). 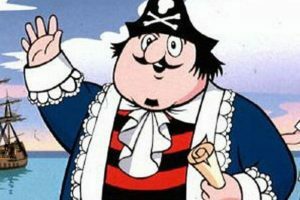 While I’m terrified of all things pirate-related, I don’t mind watching that seminal 1960s/70s animation Captain Pugwash. CGI hadn’t been invented way back then, so the creative genius behind the programme, John Ryan, lovingly drew and painted the scenery and characters on cardboard, cut them out and filmed the whole thing in real time. Pugwash was a bumbling, incompetent type of pirate, who was saved at the end of every episode by the ingenuity of the young cabin boy. There are many legends surrounding the real pirates of yore, but none more bizarre than those attributed to these innocuous cardboard cut-outs. I’m not going to go into detail here, but John Ryan successfully sued two national newspapers regarding false allegations made in the 1990s about the names of some of the crew. You couldn’t make it up. To make sense of what comes next, watch the first colour episode of the series, and listen closely to the theme tune. Let’s put my childhood trauma on the back burner for a while and scroll forwards to a few years ago, when I was designing practical ideas to help young children develop their early handwriting skills. Before children can develop mature handwriting, they need to have full control over how they move and coordinate the large and small muscles of their bodies. If they can make these gross motor movements quickly and slowly, then they can eventually concentrate on using a pen to make marks on paper that will one day become beautiful handwriting. Apart from being able to move in a controlled way, children also need to make sense of what they are being asked to do, and to talk about what they are doing. This was brought home to me when I talked to a class of four-year-olds about the word wave, as a prelude to looking at wave patterns in handwriting. I said, “Can anyone show me a wave?” Obviously I was thinking about the undulating topography discernible in the South Downs, or the forms created on a slightly choppy sea off the Cornish coast, or even the bright green hillocks of Tellytubbies land. I’m sure you were as shocked as me when 30 children started waving ‘bye bye’ at me. I didn’t see that coming, I can tell you. So how do you get children to understand about movement, making marks and to link it to their language development? I had been introduced to a brilliant scheme from Holland called Write Dance, which seemed to be just the ticket. This project, tried out on (and apparently loved by) real Dutch children and their teachers, combines poems and songs with actions like ‘waves’, ‘spirals’, ‘straight lines’ and ‘zig zags’, so that children can learn the language of writing and develop their gross and fine motor skills at the same time. They can move around as a class to the lovely music (supplied on a CD that comes with the book) and then listen to the music and rhymes as they are inspired to draw shapes and patterns on big sheets of paper. It’s a brilliant idea. Slight problem: none of the teachers who I met could stand the music. So the whole moving to music project got shelved and the Write Dance book invariably got shoved to the back of the resources cupboard. Consequently, thousands of children’s early handwriting suffered. I was undeterred (also I was being paid to come up with a project with loads of successful early handwriting activities.) So if the music was the obstacle, then we had to find some great sounds that the teachers would automatically dance to, and be so excited about it that they would want to share them with the children in their care. And that, dear reader, is what we did. Let’s take the word ‘wave’. In the UK, we have lots of wave shapes in cursive script (joined up writing) so it’s good to be able to make these shapes and talk about wave patterns. We devised a whole project about waves, including looking at photos of waves, storybooks about the sea and, quite naturally, about pirates. But what music could we use that would instantly evoke visions of waves on calm and rough seas? I asked a set of primary school staff to meet me in the school hall, to see if we could come up with some suitable tunes. The ideas came fast and furious. What about Beethoven’s Moonlight Sonata for the slow movements and a particularly intense section of Dvorak’s From the New World Symphony for fast actions? We turned the music up loud, but nobody moved in any way that looked like a wave. Several people yawned. Now, on every school staff you will always find a ‘muso’ and someone with an encyclopaedic knowledge of all things 1970s. In this case it was me who was both those things. “Oh, why didn’t I think of it? You mean Albatross by Fleetwood Mac and the theme tune to Captain Pugwash (known by all sea shanty lovers as The Trumpet Hornpipe)?” No sooner had these words left my lips than the IT coordinator had downloaded the mighty Fleetwoods’ number one tune and a great version of the hornpipe by the CRS Players. With the amp cranked up to 11 we were all prancing around the room with our arms folded and bobbing up and down in a rhythmic wave-like way. Then the music changed to Albatross and we all automatically floated round like Stevie Nicks in her best gossamer gown. It worked!! (Apart from the IOW Festival survivor, who woke up and mumbled, ”Hey man, has anyone seen my chick’s kaftan? And when is Hendrix going to be on?” then promptly went back to sleep. We all had a great laugh. In no time we had chosen Popcorn by Hot Butter (we used the original, but you might like this slightly scary metal version) and the theme from Jaws to evoke ‘zig zags’ and Oxygene by Jean-Michel Jarre and Oh Yeah by Yelo to represent ‘robots’ (to generate talk about lines and squares). And do you know what, dear reader? The children loved the songs and moved too (apart from those in the IOW Festival survivor’s class, who apparently enjoyed moving and drawing to The End by The Doors and Suzanne by Leonard Cohen). This is so true Michael, the soprano voice, lyrics and music in Write Dance made us all want to run away and ‘wave’ goodbye for ever! Who can forget the memorable ditty, ‘My hill is over there, your hill is over here’?? Thank once again for taking the time to write these great blogs – they are full of really interesting stuff and always make me smile. I should point out that the Write Dance programme is a brilliant idea, and I highly recommend that teachers invest in it. The point I’m making in the post is that some adults and children don’t instantly ‘get into’ the music or language, while others do, so they should consider adapting it to suit the children they are working with. Thanks for your kind comments! Keep smiling, man. ‘Because this one goes up to 11’ it’s logical…. Seriously Mine, please read my reply to Sue Thomas about the value of Write Dance. It’s a great scheme, but like any approach in education, teachers should feel free to adapt a resource to meet the needs of the children they are working with. Write Dance sounds well worth trying. I saw the value of movement and music and language learning with ‘Take 10’video materials designed to help children learn foreign languages. Going on a walk starting at Coleridge’s cottage in Nether Stowey, Somerset on Sunday. Will be whistling ‘Albatross’ along the way. Hey Michael I point you in the direction of a vid on youtube with, One Love (The Stone Roses) Sung in the voice of Captain Pugwash. Priceless. Does that make you the David St Hubbins of your band?